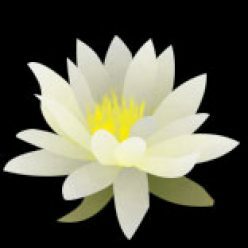 “Zen Master Jingyin Kumu in Dongjing, who is a Dharma heir of Furong, and whose Dharma name was Facheng, said to his assembly, “If you know the matter of going beyond Buddha, you must have the ability to talk about it. Zen worthies, tell me! What is the matter of going beyond Buddha and ancestors? Jingyin Kumu was a very important teacher in the 10th and 11th century. The translation of his name means “dead tree”. I smile at that because there was quite a long period of time when the object of my meditation was “be like a dead tree.” What does that mean? For me, my concentration was focused on cutting off from the sense gates so thoroughly that you can enter into a very deep sense of silence and stillness. You are not distracted even by sense objects. Mindfulness has two aspects. One is fully being present and mindful of the objects of the sense gates which awaken and acknowledge what is happening in the present moment. The second aspect of mindfulness is the opposite – not being attached at all to the object of the sense gates and actually interrupting the connection between organ and consciousness. This is a very deep understanding of “mu” or “negation”. The explanation from the teacher, “dead tree,” continues by saying that there is a child of a certain family who demonstrates that his consciousness isn’t fully functioning. On first reading, one might assume that this child is a real child with some mental disability. However, Okumura Roshi suggests that this is a child like a bodhisattva in the families of the buddha. This child has gone beyond the six sense organs and therefore, the 7th consciousness doesn’t function completely – doesn’t circulate all circumstances around an “I”. There is a discernment in the translation of this – does this mean the seven consciousnesses do not function well or does this mean the 7th consciousness, the Manas “I” consciousness doesn’t function well. Okumura Roshi has decided to use the second interpretation. There are 6 organs of consciousness with corresponding objects and corresponding consciousness. Here is a chart to better demonstrate this. The first column are the organs of consciousness – eye, ear, nose, tongue, body and the Buddhist’s add mind. This mind is just the organ of the brain which excretes the object of a “thought”. This mind doesn’t put things together yet. It is treated as a sense gate. Each organ has an object – sight, sound, smell, taste, sensation and thought and each organ has a corresponding mind consciousness that registered the object. Word projection is the beginning of our mind organizing our thought often called “formation” in the five skandhas, leading to all our stories about the world and our senses. Formation is the precursor of our complicated consciousness. The Mind organ’s projection is called ‘dream projection’ which is interesting because these fantasies don’t have a root in concrete external sense objects like the other sense gates. The next column is the “MU” negation of the “dead tree” practice. Because we are not making the connection between perception and formation, we aren’t registering the sense gates. Katagiri-Roshi used to call the ability of consciousness to make this connection – “the together-maker.” But in this “Mu-ness,” there is no contact between organ, object and consciousness. It is like the Heart sutra talking about the sense organs: no eyes, no ears, no nose, no tongue, no body, no mind. Then speaking of the objects: no sight, no sound, no smell, no taste, no touch, no object of mind. Then it goes on to negate the organ consciousnesses: no realm of eye consciousness, no realm of ear consciousness, no nose consciousness, no tongue consciousness, no body consciousness, no realm of mind consciousness. Often the repetition of the consciousnesses are suggested in the sutra by …. 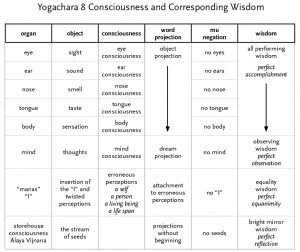 Taken from the Lankavatara Sutra, I added the column of the word projections and the last column of the corresponding Wisdoms. I very much appreciate adding the last column. 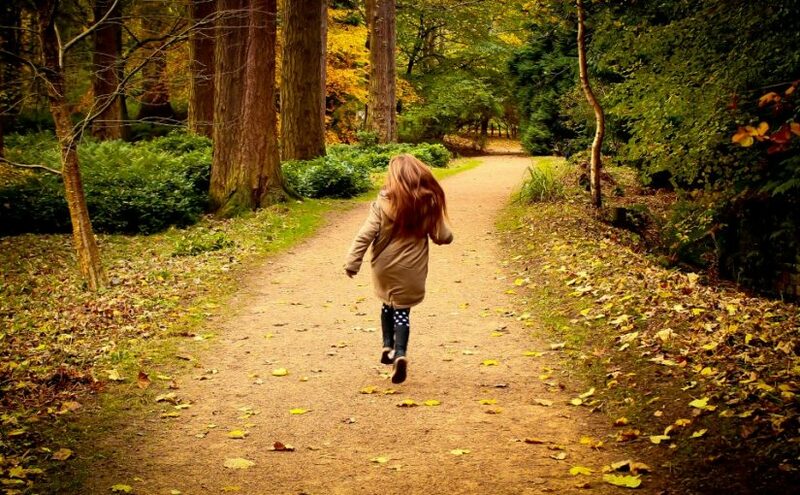 That is how you come back from emptiness, returning into form and daily life. Your action in daily life is the expression of one of the wisdoms. This suggests the pictorial depiction of the person walking with open arms in the market place which is shown as the last of the 10 ox-herding pictures. When your five skandhas has been cleared of history and attachment, you use your “self” for the benefit of life and others. Freely and openly without a hitch. All the five sense gates of concrete objects become all-performing wisdom or perfect accomplishment. The Mind sense gate, always slightly different, becomes observing wisdom or perfect observation. The last two consciousnesses are distinctive and more complicated. The 7th consciousness is called the Manas consciousness. It is our discriminating consciousness that takes all the other consciousness and twists them around so that they have the illusion of encompassing a centralized, solid “I”. Sometimes it is called ego-consciousness. This child as it says in the text doesn’t have a fully functioning “I”. Our practice has matured enough that we are no longer twisting all of our perception and making a solid “I”. The Manas consciousness can be untwisted through practice! We become non-attached to the erroneous perceptions and start to function with equality wisdom or perfect equanimity. All things are appreciated for themselves, and go beyond the reflection of what this object or event may or may not do for ME. The 8th consciousness is the Alaya Vijnana or storehouse consciousness. It influences all the other consciousness as the seeds of everything karmic are stored there. If we interpret the seven consciousness in the text as the 7 preceding consciousness, we would exclude the 8th consciousness and that doesn’t seem right. This is why Okumura Roshi said that the translation above, should be the seventh consciousness, Manas. The storehouse consciousness arises to bring in all the conditioning, personal and external, that influences are interpretation of the preceding consciousnesses. Through practice, we can become more fluent in bright mirror wisdom or perfect reflection without the judgement of good and bad, right and wrong, evaluation and judgements that comes from our karmic seeds. We can also try to water wholesome seeds and pull out the weeds from our garden of thoughts and actions.